BY THE MID-1700s, it was clear that the American settlers had become increasingly less English. Travelers described Americans as coarse-looking country folk. Most colonists wore their hair very long. Women and girls kept their hair covered with hats, hoods, and kerchiefs. Men and boys tied their hair into “qeues” (ponytails) until wigs came into vogue in the port cities. Colonials made their own clothes from linen (flax) and wool; every home had a spinning wheel and a loom, and women sewed and knitted constantly, as cotton cloth would not be readily available until the nineteenth century. Plentiful dyes like indigo, birch bark, and pokeberries made colorful shirts, pants, dresses, socks and caps. Americans grew their own food and ate a great deal of corn—roasted, boiled, and cooked into cornmeal bread and pancakes. Hearty vegetables like squash and beans joined apples, jam, and syrup on the dinner table. Men and boys hunted and fished; rabbit, squirrel, bear, and deer (venison) were common entrees. Pig-raising grew important, but beef cows (and milk) were scarce until the eighteenth century and beyond. Given the poor quality of water, many colonials drank cider, beer, and corn whiskey—even the children! As cities sprang up, cattle drank beer, yielding a disgusting variant of milk known as “swill milk” that propagated childhood illnesses. Infant mortality was high, and any sickness usually meant suffering, and often, death. It was common until the late 1700s for families not to even name a baby until about age two, when the child showed that it would survive. Up to that point, it was called “the little angel,” “the little visitor,” or simply (my favorite) “it.” Colonials relied on folk medicine and Indian cures, including herbs, teas, honey, bark, and roots, supplemented with store-bought medicines. Doctors were few and far between. The American colonies had no medical school until the eve of the American Revolution, and veterinarians usually doubled as the town doctor, or vice versa. Going to a physician usually constituted the absolute last resort, as without anesthesia, any serious procedures would involve excruciating pain and extensive recovery. Into the vacuum of this absence of professional healers stepped folk healers and midwives. “Bleeding” (drawing blood from the sick person), a common medical technique via leeches, stemmed from the so-called “humoral” theory of medicine still in vogue, wherein all body malfunctions originated in an imbalance of one of four body “humors” or liquids (black bile, yellow bile, blood and phlegm). Conveniently, doctors usually sought to adjust the blood level, as that was the humor they had most rapid access to. Needless to say, more than a few “quacks” practiced medicine. Yet folk healers, including early chiropractors called “bone crackers,” provided valuable services to a grateful constituency. Children worked hard because all Americans worked hard, all their lives. But kids always found time to play games like “tag,” “blind man’s bluff,” “Here we go round the mulberry bush,” and “London Bridge.” Boys played ball and girls played with dolls made of rags and corn husks. In the winter they sledded, and in the summer they swam. Most boys and girls, certainly in frontier areas, learned how to plow, mend fences, skin animals, dress meat, fish, shoot, hunt, and ride. Their lives, like their parents’ lives, were tied to the seasons as they worked and played and civilized the raw land, and their survival to a deadly aim trained on an attacker, man or beast. It was nothing for a father to go away for days or even weeks, leaving a young teenager in charge of the farm, the livestock, the house, and the other family members. At 12 or 13, most boys sought work in the form of an apprenticeship, where they learned a craft or trade from a cobbler, barrel-maker, tanner, fisherman, or other skilled artisan. Women, expected to bear between five and 10 live children, could anticipate a dozen pregnancies. Bodies wore out fast, and women aged rapidly. With infant mortality high, families typically did not name a child until he or she had reached the age of two: prior to that time, parents would call the baby “it,” “the little angel,” or “the little visitor.” Overall life expectancy hardly tells the tale of the everyday life, where work was hard, the most minor sicknesses potentially life-threatening, and pleasures few. 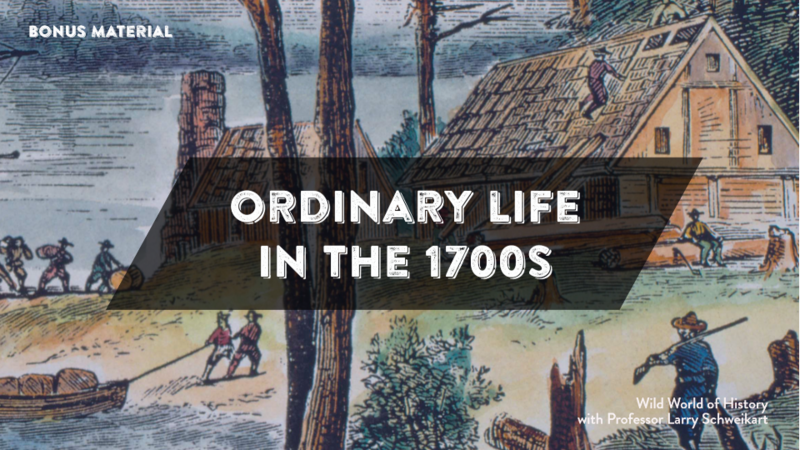 Despite the reality of this coarse life for common folk, it is worth noting that by 1774 American colonists already had attained a standard of living that far surpassed that found in even most of the civilized parts of the modern world.